What they say? Parisian pop entity Las Aves return with satirical new slice “You Need A Dog” – a commentary on the modern break-up cure. 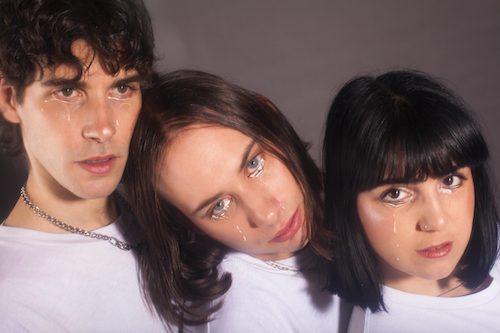 Partly produced by Geoff Swan (Charli XCX, Grimes), “You Need A Dog” surprises with its unabashed originality, revealing rave spectres from the noughties. Shot on 35mm film, the video depicts the desperate honeymoon of a teenage girl and her dog in the suburbs of Paris. It evokes eccentric films of Gregg Araki or the fragranced romanticism of Sofia Coppola. What they say? Whispering Sons’ contemporary version of dark and hypnotising cold/new wave gets up under your skin, and with Fenne Kuppens as frontwoman, they’ve found one in a million. The Dutch press described her as ‘Beth Gibbons’ steely, aggressive sister’ earlier this year after three knock-out performances at Eurosonic. She could even be Nick Cave’s younger sister in his Birthday Party years. The truth is, that after years of touring – the band’s live performances still pack a sledgehammer punch, and Fenne crushes it with her black-as-night voice and maniacal stage presence. What they say? Nashville’s Dreamer Boy has us wrapped around his finger with dreamy beats and gentle lyrics inspired by love, adventure, and life’s simple pleasures. Also known as Zach Taylor, his frequent collaborators Bobby Knepper, Adam Alonzo, and Cody Clark provide an amalgamation of ambient beats, droney R&B lyrics, and Southern Charm fused in strangely perfect harmony. Delivering their own unique style of music that could be most notably described as “Cowboy Pop,” Dreamer Boy’s debut album is brilliant and forward-thinking. Filmed in one take thirty minutes before soundcheck for a performance with The Marias at renowned venue Pappy & Harriet’s, a hand-held camera finds the artist in repose near a lone Joshua Tree as the deep dusk glows with intoxicating purple hues. As Zach’s doo-wop falsetto weaves around a laid back drum machine alongside roommate/producer Bobby Knepper and friends, the circle bounces to the beat with cowboy hats that won’t stay on to a melody that marries soothing vocal harmonies with the experimental pop production. It’s an enchanting sunset serenade, full of fun and spontaneity. What they say? Priscila B brings from Brazil her love of early Tropicalia and the kind of ‘let’s be bad’ attitude that can only come from a land chock full of Catholic guilt. Mimi B brings her love of stripped down, bare essential rhythm. If two drums are good enough for Peggy O’Neill then they should definitely be good enough for you. Together they bonded over a mutual love of 50s malt-shop-pop, 60s minimalist garage, no wave, fuzz and all forms of outsider art. ‘Art damaged’ isn’t a slur, it’s a compliment. Anything lost in translation with this transatlantic duo only doubles the charm. Played entirely on thrift store instruments with the kind of enthusiasm and naiveté severely lacking in a lot of today’s music this is not some clever re-imagining or ironic take on lo-fi, this is the real deal! Technique and skill be damned, the message comes through strong and that message is “Don’t think about it, just cross the line and enjoy it.” All rolled together with gum, glitter, and sticky tape in the studio by fellow Bir­mingham noisemakers Black Mekon, the result is slightly wrong-sounding but infectious one-minute-ga­rage-pop with gusto. One guitar, 2 drums, the basement band you always wanted to start. What they say? Heavenly Recordings are pleased to announce they will be releasing the new single from Melbourne, Australia’s, Mildlife. ‘How Long Does It Take?’ plus two remixes by Italo-disco legends Daniele Baldelli and Marco Dionigi will be released digitally on April 12 followed by 12″ vinyl on April 26. Reward’s ten songs were conceived alone at a piano, which remains evident by the feeling of closeness that they convey. Although eventually recorded across America and the UK, and roping in a roll call of trusted collaborators (including Stella Mozgawa of Warpaint, H.Hawkline and Samur Khouja as co-producer),The result is an album every bit as stylistically varied, surrealistically-inclined and tactile as those in the enduring outsider’s back catalogue, but one that is also intensely introspective and profound and significantly her most personal to date.